After months of build-up, and more than a little anxiety, the Great American Eclipse came and went all too quickly for most viewers Monday, Aug. 21. “It’s was a whirlwind, but we were able to pull it off. Everyone was respectful and friendly and took great care of our park, and the big payoff this morning made it all worth it,” said City Councilor Marlene Parsons, who spearheaded the organization of the Keizer Eclipse event at Keizer Rapids Park. Parsons and other city councilors who participated in the all-weekend effort recapped the event at the Keizer city council meeting the evening following the eclipse. The Keizer Eclipse event in Keizer Rapids Park drew visitors from several continents and numerous states and all of them turned to stare at the sun as it appeared behind the moon, eliciting, oohs, ahhs, and a general excited ruckus. Alan O’Connell, along with wife Emma and daughter Rudy, traveled all the way from London to snag a spot on the big lawn. The O’Connells arrived at 1 p.m. on Saturday and already had rave reviews of the park’s Big Toy. “It’s brilliant and the xylophone thing is great. That’s probably the best playground we’ve ever been to,” Alan said. “We’ve only been in this park so far, but it’s really beautiful. We are really happy that we came here because the set-up is just perfect,” Emma added. Denis Vrba and Judson Barnes traveled down from Vancouver, British Columbia, and Vrba brought with him a friend, Denis Stoltz, from Sudetenland. The trio visited and took pictures with Mayor Cathy Clark before settling in for the night. Vrba was most impressed with the people he’d seen around the park as volunteers. “There are so many people active and involved,” he said. Barnes said there were some things not that different from home. “Most of B.C. is on fire right now and we came to Oregon and it’s the same thing,” he joked. Manon and Maarten Van Wamel, who also live in B.C., were hosting a nephew from their native Netherlands and decided to make the trip to Oregon almost on a lark. Manon said the reasonable price for the location made it ideal. She and Maarten had both seen an eclipse in 1991, but they were more prepared to enjoy it this time around. “I was working at an airport the first time and the biggest thing was everything went silent, which is unusual for an airport,” Manon said. “I was in a forested area and we were laying down on ground. You could see the shadow approach and go away,” Maarten said. Their nephew Floris Reininga and his girlfriend Laura Vingelvein already planned to visit Canada but the eclipse opportunity came up unexpectedly. “We had no clue,” Floris said. The group took advantage of the trip to Oregon to visit the Canby Rodeo, which was another highlight for Laura, a horse enthusiast. “It was awesome and so cool,” Laura said. Visitors from Brazil, Tijuana, Japan and Australia had all checked into the camp by the end of the weekend. 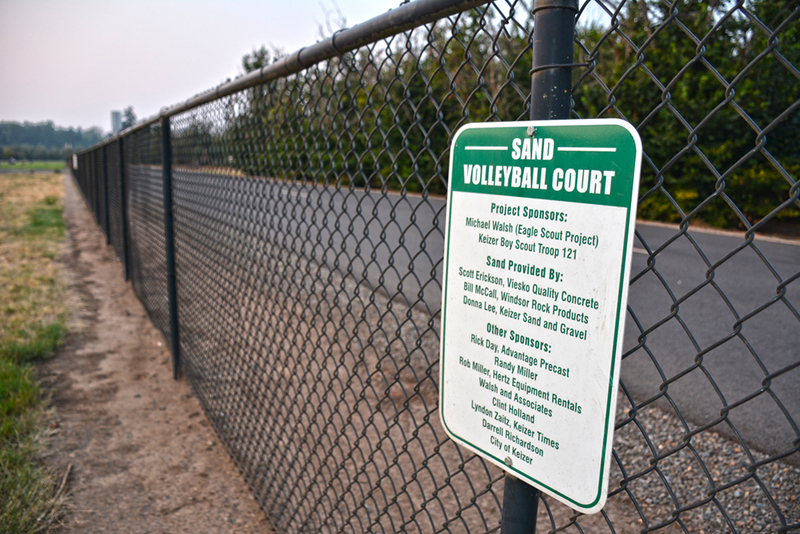 The event, a fundraiser for the Keizer Parks Foundation, is expected to bring in upward of $30,000 when the final tallies come in, Parsons said. Keizer’s Community Emergency Response Team (CERT) provided a variety of services 24/7 at Keizer Rapids Park, including patrolling the area for fire hazards and an around-the-clock first aid station. Across town, the Salem-Keizer Volcanoes made the most of the eclipse by hosting the first-ever eclipse-delayed baseball game. The Volcanoes hosted visitors from six continents, 34 states and even representatives of NASA who spoke about the eclipse-related science before the game. Clark said viewing the eclipse with the nearly 6,000 people in attendance at the stadium helped her understand the hubbub surrounding totality. 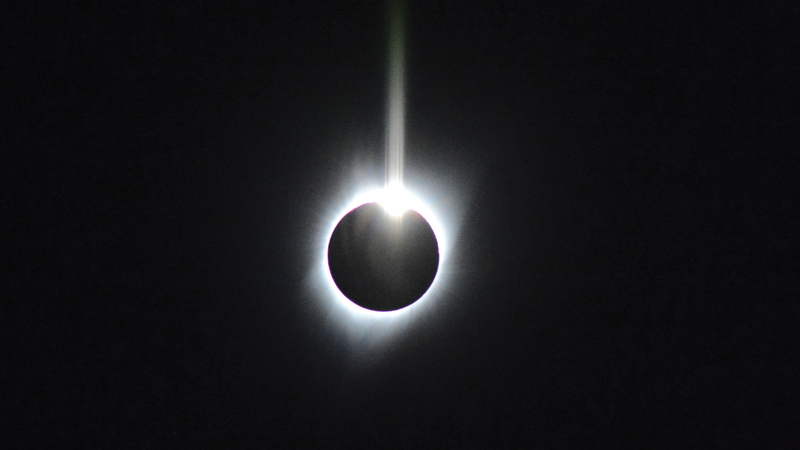 “It was absolutely phenomenal, and I understand why people want to be in the zone of totality,” Clark said. The Keizer Planning Commission wrangled with the fallout from a recent U.S. Supreme Court decision during its Aug. 9 meeting. 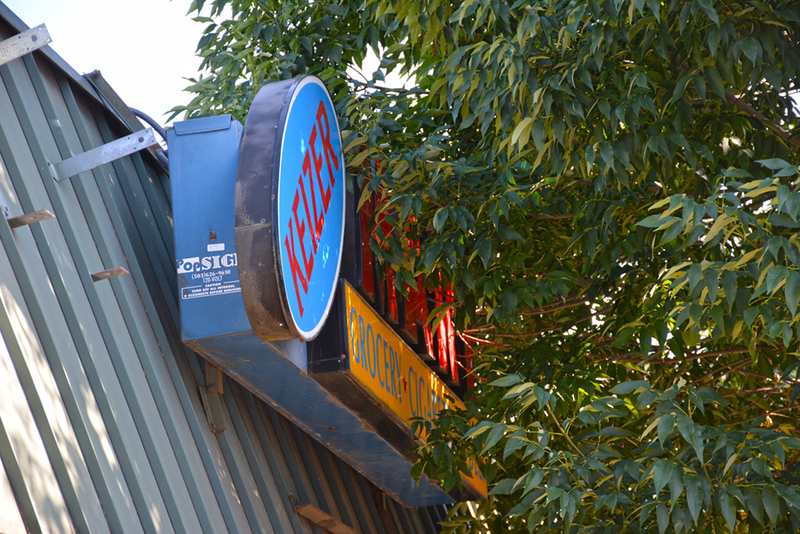 City staff presented a host of changes to Keizer’s sign code that brings the city into line with the Supreme Court’s decision, clears up some areas of ambiguity, and will grant additional latitude to business owners regarding signage. In the Reid vs. Town of Gilbert judgement, the Supreme Court determined that sign codes need to be content-neutral, which is another way of saying the code cannot suppress freedom of speech. That caused an issue for Keizer because it has rules applicable only to real estate and political signs. A public hearing on the issue will be continued at the commission’s September meeting, but the commission reviewed and offered input on the suggested changes. • Allowing for a wider variety of geometric shapes. • Placing signs for real estate, elections, government signs and non-profit signs into a larger category of temporary signs. • Allowing temporary signs, such as banners, to be attached to buildings for up to 120 days within a 12 month period. • Allowing portable signs and feather flags to be placed one-per-storefront with a 10-foot separation. • Creating a new section that permits special signage for grand openings and special sales. • Allowing electronic signs to change once every 60 seconds – the current code limits changes to once every 15 minutes – and allowing them to be attached to walls. • Allowing smaller, secondary frontage signs for all businesses. The current code only allows such signage in Keizer Station. The proposed changes are the result of staff input and conversations with the Keizer Chamber of Commerce. The most-talked-about change was allowing electronic signs to change more frequently. The current limit of once every 15 minutes falls far outside the industry standard of once every eight seconds. In Keizer, there is even greater limitation on electronic signs associated with public entities, such as Keizer Fire District and McNary High School. Those messages can only change once per day, but would be treated the same under the new code if the changes are approved. Jonathan Thompson, speaking on behalf of the Keizer Chamber of Commerce Board of Directors, told commissioners that the Chamber preferred the eight second standard. “One of the reasons that folks want the eight seconds was what we saw when police went up and down River Road asking businesses to put up messages about the fee hearing. It would be easier to post something like that in with a message from my business,” Thompson said. Testimony from Justin Briley, one of the new owners of Keizer Mart on River Road North, revealed the need for one of the changes in the code and a space where conflict between competing goals has arisen. Keizer Mart is located in Keizer Plaza with 12 other businesses and Briley drew the ire of some of them when he began placing signs outside promoting new ownership and other aspects of the business. “We were unaware that there was any kind of restriction and I later found out that we had to share between everyone in there,” Briley said. That’s one of the reasons for the proposed change to portable signs and feather flags. If the change is approved, a space like Keizer Plaza will be allowed more overall signage. Briley also said he has trouble attracting attention of southbound drivers on River Road North despite having a sign on his River Road frontage wall. The problem is that a tree planted for the purpose of beautification now completely obscures the sign. “Our urban renewal program sought to plant green trees along River Road, but that competes with the visual space available for business,” Brown said. As far as input from the commission, there was some support for both the more rapid change of electronic signs and some that preferred longer times, but the majority appeared to feel a 60-second rate of change was ideal. I’m helping my third client of the Keizer Community Food Bank (KCFB) collect items for a food box when I notice that we’ve run out of laundry detergent. It’s not an absolute necessity, but it’s not the only thing that’s disappeared. There wasn’t much bar soap to begin with, ranch dressing is dwindling and the quarts of 1 percent milk left can be counted on one hand. My third client of the night means we’ve only helped about a dozen of the 20 families waiting for food boxes. There’s plenty of bread and even fresh fruit and vegetables still available, but it’s the extra items that can add a lot to a grocery bill I wish the food bank had in greater supply. It’s Monday, Aug. 14, and it is not the first time I’ve “muled” for KCFB. “Mules” are the food bank lingo for the volunteers that help clients collect items for their food boxes and then assist them with loading into their vehicles. I sincerely doubt it will be my last time. Tonight the members of the Keizer City Council and City Recorder Tracy Davis visited for a tour of the facility. Davis, Councilor Roland Herrera and Mayor Cathy Clark stayed for volunteer shifts. No one asked me to stay, but I’ve seen the work that this food bank does, talked with volunteers and directors past and present, volunteered alongside them, and come to realize that what happens here is less about food and more about hope. Even so, it’s been a time of change for the food bank and for clients, says Rev. Curt McCormack, the director of KCFB, a interfaith collaboration of five Keizer churches. “Right now our numbers are down over last year, we used to see about 220 families a month and now it’s about 175. The difference is we are seeing more new clients each month,” he says. He’s uncertain how to interpret the data. It could mean that some families are finding jobs easier to come by, but it seems that others (maybe those in other industries) are finding themselves in need for the first time. On the other hand, there is a healthy amount of food on the pantry shelves. In the past, I’ve seen it as bare as a few cans and boxes per shelf. There are, of course, needs. Canned fruit or pre-packaged cups of fruit or applesauce are always hard to come by here. Those items are often more expensive per ounce than canned vegetables or proteins. 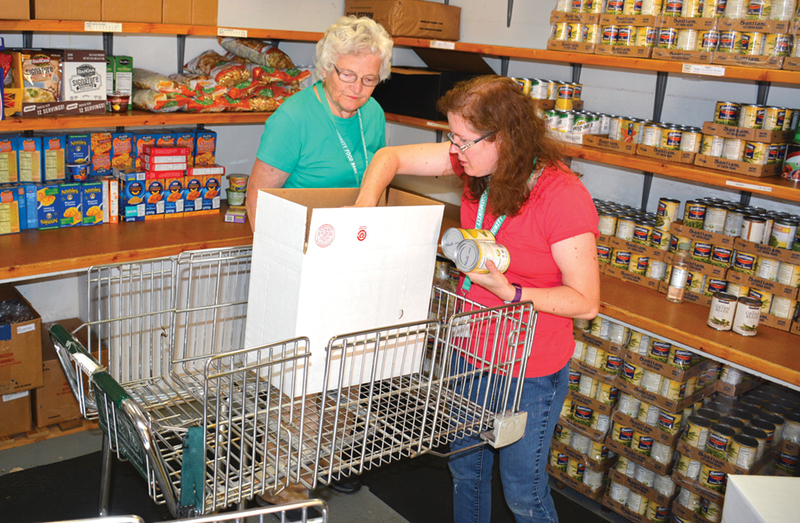 KCFB gets about 80 percent of the food it provides to families from the Marion-Polk Food Share, another 5 percent is donated directly to the food bank, which is housed at Faith Lutheran Church on River Road North. The remainder is purchased with financial donations, and McCormack can purchase about $3 worth of food and other items for every $1 in donations. Recently, it’s become more important to have the financial donations to purchase specific items when the food bank runs low. “There are times when we have more rice than we can give away, but it’s a low rice time right now,” McCormack says. The food bank also deals with an unpredictable schedule in terms of orders from the Marion-Polk Food Share, which are completed two weeks before a truck delivers it, and needs of clients that change from week-to-week. McCormack could take advantage of a local cannery that will sell canned food cheap in bulk, but he would have to buy it by the pallet and then figure out how to transport it to Faith Lutheran and store it until it is all given away. “That’s why dollar donations work better. We can buy what we need when we need it and the dollar goes a lot further,” McCormack says. I don’t feel like it’s a stretch to say that those dollars buy hope. Food on the table or less stress around it means families can have one more day when life in general is less of a struggle. Visiting a food bank for the first time is likely a pride-shattering choice for anyone, but what has always impressed me is the collective character of the volunteers who welcome them into the fold without judgement or pity and do their best to send them on their way able to hold their heads a little higher than when they came in. As a volunteer, being around others so willing to see the best in every person feels like redemption for some of the other horrors the world foists upon us. That’s what keeps me coming back. I suspect the experience is the same for others, and it’s a huge return on a $1 investment. For more information on donating to KCFB, call 503-871-9100. Sustainable giving options are available. McNary High School is pushing a more positive behavior system, where instead of only focusing on the students who are doing something wrong, kids will be rewarded for making good choices. The system, Positive Behavior Interventions and Supports (PBIS), was brought to McNary by former assistant principal Jay Crystal. But new assistant principal Dan Borresen wants to take it to another level. Staff will have the cards to be given to students they witness making good choices. The kid will then write their name on the card and turn it in for a monthly drawing. A business or anyone wanting to donate to the bold card program can contact Borresen at 503-399-3233. “We want to encourage our kids to be a part of our McNary family and be good people and help one another while they’re doing it,” Borresen said. McNary also has a new option for students struggling with behavior—a new study area called the Celt Center. Since many teachers use Google classroom, the Celt Center will be equipped with computers as well as an aide proficient in study skills. 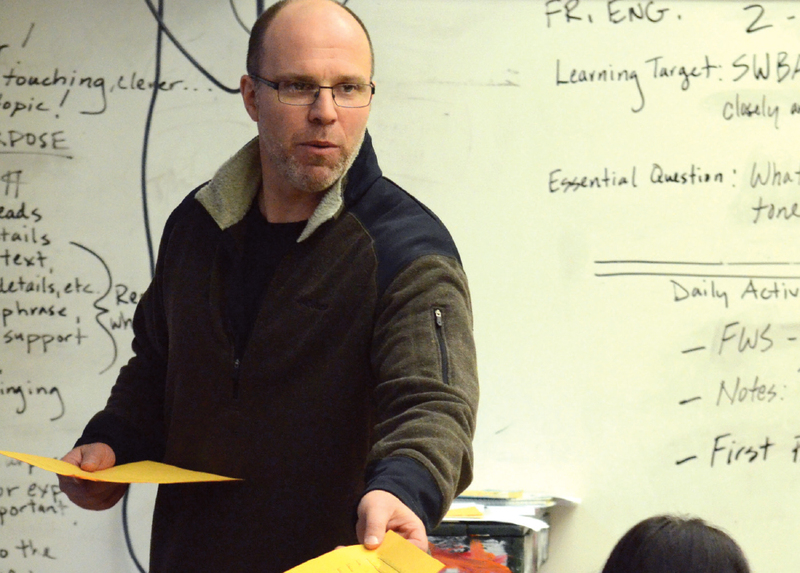 McNary staff has also been asked to try to understand what a student might be dealing with at home and build relationships and work with kids that traditionally they might have written referrals for. Last school year, 2016-17, McNary cut its teacher referrals down from 649 to 405. 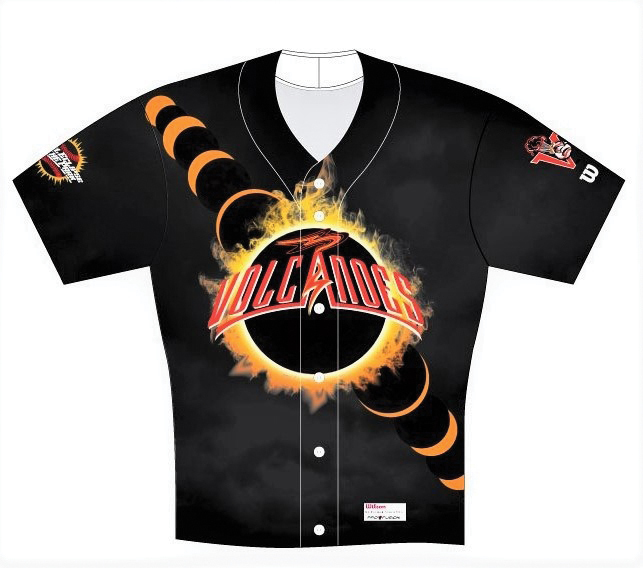 When news got out that the Salem-Keizer Volcanoes were going to be the first professional sports team to delay a game for an eclipse, NASA was so impressed that they decided to send six scientists from all over the country. On Monday, Aug. 21, gates to Volcanoes Stadium will open at 5 a.m. Breakfast will then be served for $10 from 6 to 9 a.m. From 6:30 to first pith at 9:35 a.m., NASA will give six different presentations. The Volcanoes will play one inning of baseball before delaying for totality of the eclipse, which is scheduled for 10:17 and set to last 1 minute and 57 seconds. NASA is live streaming the game worldwide on its website at www.nasa.gov/eclipselive. Admission to the game includes top-of-the-line NASA eclipse glasses. “You’re never going to find a better situation for glasses than to get those,” Lisa Walker, co-owner of the Volcanoes said. As of Wednesday, only a select number of tickets were available for Monday’s game through the Totality Eclipse Package, which for $50 includes general admission to all four games Aug. 18-21. Another option is the Party Patio, which are $50 for Monday only. “It’s a beautiful location between the dugout and bullpen,” Walker said. 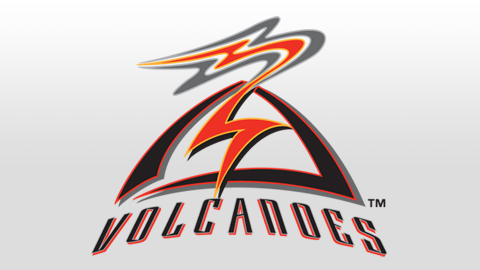 For availability, call 503-390-2225 or visit volcanoesbaseball.com. “We have no intention of selling tickets the day of the game,” said Walker, who also recommended purchasing parking beforehand. EclipseFest will begin Friday, Aug. 18 with BrewFest at 3 to 10 p.m.
A NASA presentation is scheduled for 5 p.m. The baseball game against the Boise Hawks starts at 6:35 with fireworks afterwards. BrewFest, which includes more than 30 beers from 15 breweries, will continue Saturday at noon. More NASA presentations are planned for 1 and 5 p.m. JT and the Tourists are performing live music from 2 to 5:30 p.m. Former major leaguer Ken Griffey Sr. is signing free autographs beginning at 5:30. The Volcanoes play the Hillsboro Hops at 6:35. Sunday is Bike to the Park Day, beginning with BrewFest at noon. NASA presentations are again scheduled for 1 and 5 p.m. A Backyard Baseball Barbecue with ribs and chicken will be served for $10 from 1 to 3 p.m. The baseball game begins at 2:05. Admission to BrewFest on Aug. 18-20 is $10 and includes a ticket to that day’s game. Salary surveys for unrepresented employees spurred debate among members of the Keizer City Council during a meeting Monday, Aug. 7. The city conducts salary surveys of comparable employees at other agencies on a regular basis and then adjusts compensation packages to bring them in-line with average pay for the given type of work. The city is required to perform such surveys for union-represented employees, but conducts the surveys for non-union employees as a matter of policy every four years. Unrepresented employees generally perform supervisory roles. This time around Human Resources Director Machell DePina recommended raising compensation in nine of the city’s 39 job classifications, affecting 14 employees in six departments. “The last time we performed the survey (2013) we recommended adjustments in more than half the classifications,” DePina said. The total cost of the cost of living (COLA) and merit adjustments – which will affect positions including the event center coordinator, legal assistant, accounting technicians and Keizer police sergeants, among others – is $52,300. The city will absorb the additional costs through better-than-expected revenues from franchise fees and liquor taxes and lower-than-expected health care costs, said Tim Wood, city finance director. DePina said the raises only bring current Keizer employees within 5 percent of averages. Councilor Amy Ryan took issue with the timing of the raises, which will be retroactive to July 1, and the ask itself. The approved 2017-18 budget included $67,400 in cost-of-living and merit-based raises. Ryan questioned why the salary survey was not included as part of budget talks that took place in May. It still did not sit well with Ryan who voted against the implementation of pay adjustments. “$119,000 in increases when we are asking our tax payers to step up is very unfair,” Ryan said. The increases were approved with a 5-1 vote. Councilor Laura Reid was absent.